How do I update the details of all my items at one go? Sometimes, you might have to change the details of your items. It could be updating the price or adding a description. If it’s just a handful of items, you can manually adjust the details. But if you had to update countless items, manual adjustments can be time-consuming. With the overwrite feature, you can bulk-update your items at once. Export the items in your inventory. Make the necessary changes to your items in the export file. Import the modified file back into Zoho Inventory. 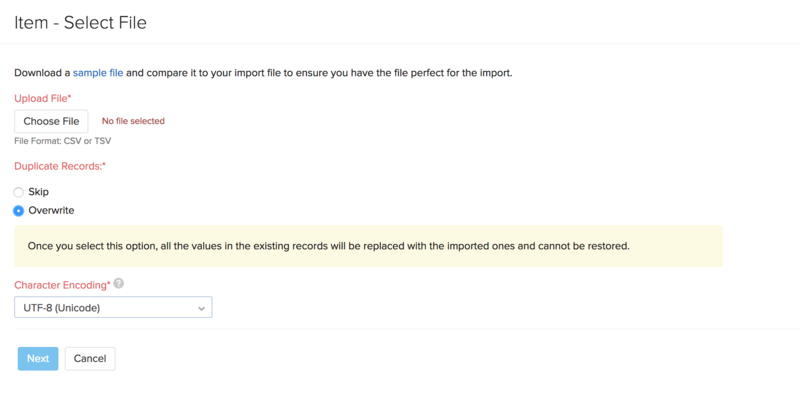 When importing, make sure to select the Overwrite option under Duplicate Records. This ensures that the existing details are replaced with the modified details for those items.